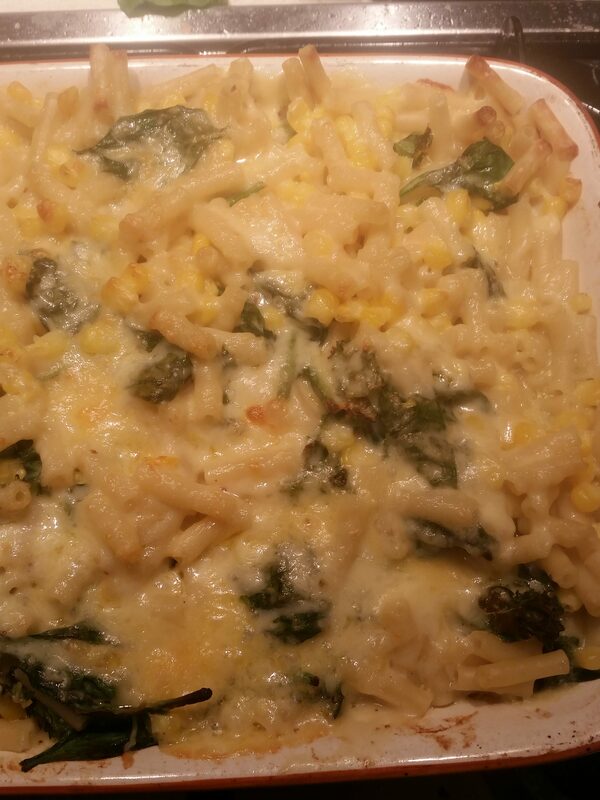 Looking at my images of this mac ‘n’ cheese I realise I am an incredibly messy cook that managed to splatter stuff everywhere and cause spinach leaves to go rogue. Perhaps I can also blame it on the phone camera, something I am hoping to eliminate from my endless blog issues sooner rather than later, and how it chooses to focus on all the wrong things instead of somehow making a tray of pasta and melted cheese look like the best thing on earth (which it clearly is). I fumbled this together nearly a month ago and have not had the chance to cook any form of mac ‘n’ cheese since which is to be frank an absolute disaster in my world. Life has been pretty hectic, in fact that is an understatement, and not only are blog posts finally having the words added to them a few short days or even hours before scheduled publish time but the whole cooking thing has totally gone out of the window (thank you to the gods for giving me the most incredibly patient partner that also happens to be able to cook a banging meal). Writing this post and having a chat about cheesy pasta with some friends has also resulted in me being bitterly saddened by the lack of mac ‘n’ cheese on the Wetherspoons menu and how if they did it they could also use it as a topper in the gourmet burgers. I even tweeted about it. I am so desperate to have cheese and pasta in my life that I am practically pleading with a pub chain to introduce some comforting goodness to their menus. A mac ‘n’ cheese recipe is largely done by just using your cooking instinct to get the exact quantities right, though obviously make sure you do an amount of sauce suitable to that amount of pasta and vice versa, and it is certainly a dish that I would suggest building up to if you are new to the cooking world. I always choose to make plenty to allow for leftovers the next day, which also happens to make doing the quantities guessing thing a little easier, as if you are going to go to the effort of doing a dish with multiple elements you might as well make it feel that little bit more worthwhile. For the sauce I usually work on the basis of a heaped tablespoon of butter, or in my case more often than not margarine, going into a small saucepan and melting it before adding a small amount of plain flour at a time. As the plain flour goes in the pan needs a good mix and slowly the butter and flour will merge together to appear like a soft ball that still has plenty of give but is not bubbling away against the low heat of the pan. The sauce for mac ‘n’ cheese is very much a game of patience as after this stage you need to add a small amount of milk in, increasing the pan temperature just a little, and continuing to give it a stir; it will seem like the milk is vanishing into the ball but this needs to be done slowly as to avoid a lumpy sauce. Once you have got it to being the texture you want for your sauce, some people like to have a thinner sauce than others, you can add your grated cheese and anything else like mustard or herbs (this is best done off the heat). If you are making the sauce before it is ready to be mixed with the pasta and other ingredients you might see a layer settle on top of the sauce, this is a completely normal part of the process and it just needs a good stir before you pour it onto the other ingredients. We usually attempt to add a few extra little bits of vegetables into a mac ‘n’ cheese as it can very quickly become a carb feast with very little actual nutrition in it otherwise. I tend to add sweetcorn, peas and if we have any mushrooms, onions and diced carrots into the boiling waster with the pasta as not only does it add a bit of health to the dish but also helps to break up the textures too. Spinach and kale can both be quite funny ingredients in terms of being cooked and going soggy so instead of doing them in advance they get mixed into the drained pasta when it is about to get mixed with the sauce and put into the oven tray as this gives it an introduction to the heat and gets it coated in the sauce before going under a high temperature grill for 15 minutes or so. If, like in the image, you have spinach and kale poking through at the top keep an eye on the tray whilst it is under the grill as they can sometimes catch a little and burn and even though that has little damage to the mac ‘n’ cheese as a whole it can cause a few issues in terms of smoking the kitchen out! What is your favourite mac ‘n’ cheese ingredients or what twists do you like to put on a mac ‘n’ cheese? This entry was posted in Food and Drink, Recipes and tagged adventure, carbs, Cheese, cheese sauce, comfort food, Cook, cooking, eat, eating, evening, food, food blog, food blogger, food bloggers, healthy, healthy food, homemade, lblog, lblogger, lbloggers, life, Lifestyle, lifestyle blogger, lifestyle bloggers, mac and cheese, mac n cheese, macaroni, not so healthy food, pasta, Recipe, tasty, vegetables, vegetarian, weeknight, weeknight cooking, yummy. Bookmark the permalink.